Amiel Mart Orio, the so-called Filipino dual voice singer, was first known for his rendition of Celine Dion and Andrea Bocelli's "The Prayer." 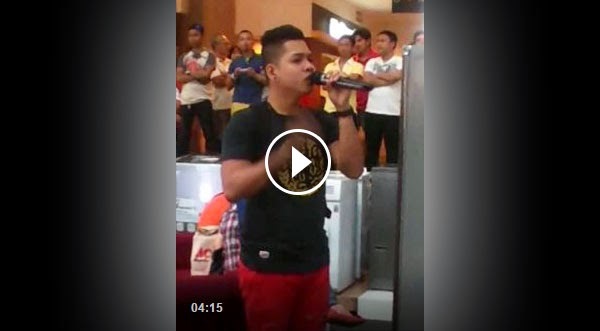 In February 2014, Facebook user Annabelle Celorico posted the video featuring Orio singing the hit duet at Glorietta Activity Center apparently during an event sponsored by Ace Hardware store. The video got more than 300,000 shares so far. It could have garnered more had popular entertainment blogs picked up his story. Among the factors of its failure to become even more viral is the lack of information about the Filipino dual voice singer. So we decided to track this guy and here's what we gathered so far. Orio hails from Mapanas, Northern Samar. His second Facebook account is the one that's active. Based on his posts, it appears that he is currently having gigs in sing-along and comedy bars such as Syncopado Bar and Café in Malate, Manila, and at the Music Box in Timog Avenue, Quezon City. He also has a YouTube channel which contains several videos from months ago. Anyone interested? It's time to give Mart Orio the big break he deserves.